A return to the WAFL is on the cards for delisted Bomber Ben Howlett next season if he’s unsuccessful in getting an AFL lifeline. 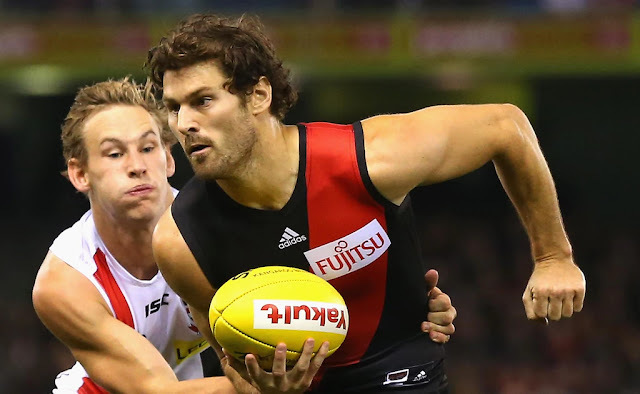 The 29-year-old, who was cut by Essendon after 124 games in eight years, is confident he still has plenty more to offer at the top level. The Donnybrook product has been in discussions with several Victorian clubs - as well as both Brisbane and Gold Coast - and is willing to go anywhere for a second chance. But with a one-year-old son, Will, the lure of coming home to WA will be strong for Howlett and his wife Emma if nothing comes of the “little bit” of AFL interest. “I still want to play at a really high level, if it’s not AFL it will be at state level,” Howlett told The West Australian. “I obviously would love to move home to WA, that’s probably something we will look at. “But if something else jumped up, I’d love to stay in Melbourne as well. Howlett has had “initial contact” with a few WAFL clubs, including Peel Thunder where he played 61 games and won the 2009 best and fairest, but nothing serious. The final delisted free agency period ends on November 26, with Howlett also able to be picked up in the pre-season or rookie drafts the following day. “I said to them that my focus is purely on AFL at the moment and once that’s done and dusted, I’ll make decisions then,” he said. Overlooked in several AFL drafts, Howlett got his chance on Essendon’s rookie list as a 21-year-old after a standout WAFL season in 2009. He made his AFL debut in round one the following year and went on to play 117 games of a possible 130 until his ASADA suspension in 2016 as part of the ‘Essendon 34’. But the durable midfielder could only manage seven senior games this year to go with 10 in the VFL. Howlett admits he struggled to build form last season after being named as an emergency several times and drifting in and out of the senior side. “It was a bit of a mixed bag year for me, Woosha couldn’t give me that consistency of games so I found my year quite interrupted at times,” Howlett said. Post-season discussions with coach John Worsfold post-season indicated Howlett was “very close” to getting another deal for 2018. But it became difficult with list spots after a huge trade period for the Bombers, when they acquired Western Bulldogs premiership forward Jake Stringer, Gold Coast speedster Adam Saad and GWS Giant Devon Smith.